Many of leading innovators in wearables, IOT and smart technology will gather at the Santa Clara Convention Centre on the 4th & 5th October at WTS USA. They include Mary Liz McCurdy, the Global Head for Google Play, Kirk Lacob of the Golden State Warriors, Arlette Hart, CSO of the FBI, Dr Jonathan Reichental, CIO, City of Palo Alto, and. participants from industry pioneers like Intel, Fitbit, Microsoft, Facebook, and Cisco. Keynote Stage - featuring cutting edge innovation and thought leading presentations. Wearable Disrupt - covering innovations in product and user applications, healthcare, performance sports, smart textiles and sensor technology. IOT Connect - a high level conference looking at the IOT economy, including connected cars, cities and data security. AR/VR - one of the fastest growing areas of connected technology. Digital Healthcare - product and user applications and the future of healthcare. Alongside the conference there will be a dedicated expo, featuring some of the most innovative companies operating in Silicon Valley and across the globe, including Recon Instruments, Dialog Semiconductor, Intel and AR pioneer Vuzix. The event effectively offers 3 shows in one - The Wearable Technology Show, IOT Connect and AR/VR Show - showcasing the very latest prototypes, innovation and thinking from the world of connected technology. 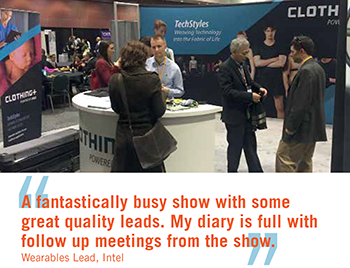 John Weir, event director for WTS USA, comments "WTS USA will again be the must attend show for anyone working in and around connected technology. We are absolutely delighted to have so many distinguished and innovative speakers taking part in our conference programme and I look forward to a very busy and informative event in California."